I've always been a huge fan of Paul Rennick's writing, so I took some time on my spring break to compile a full show transcription with rhythms, stickings, and dynamics as accurate as possible to the finals presentation of the book. Cheers! people need to be more like travis. baller status. Last edited by jonnycamarena on Thu Apr 11, 2019 12:43 am, edited 1 time in total. I didn't see the tempo change in the middle and I WTFed at the last section. 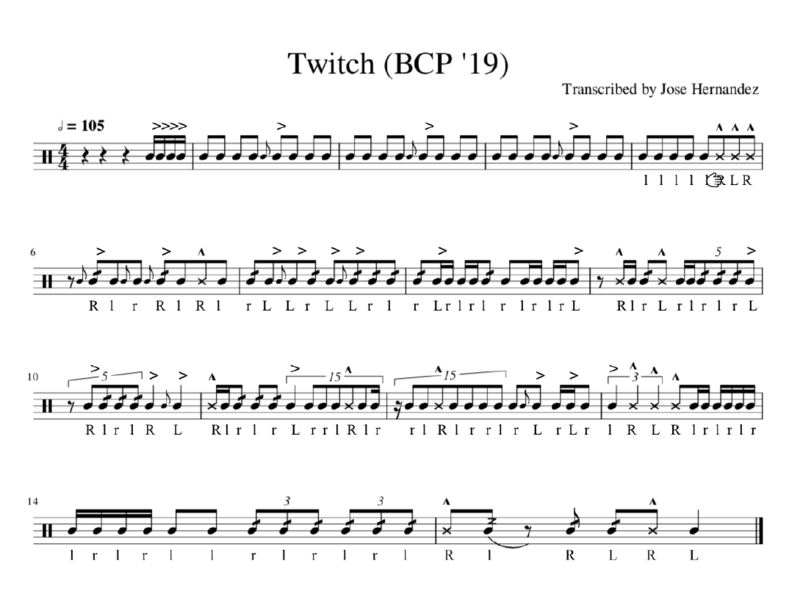 This is the full battery transcription for the first movement of the 2019 Broken City Percussion show, "Cede." Keep in mind this is only a transcription, so if you do manage to find any errors, please feel free to reply to this forum post, so that I can attend to them as soon as possible! This is the finals version of their music from "WGI World Class Percussion Championships" on April 13th.